Open Gov Hub is a unique meeting place and resource center for a network of over 40 NGOs promoting open government reforms around the world. 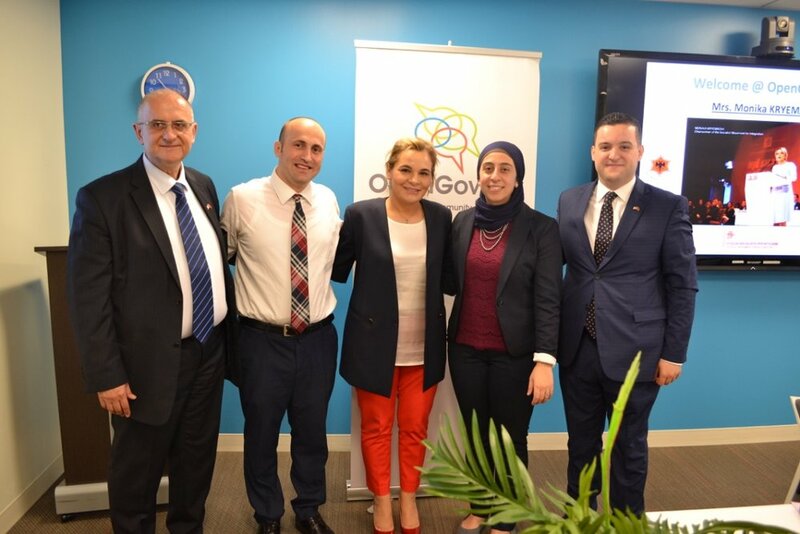 The Hub hosted Chairwoman Kryemadhi to learn about her priorities and challenges and discuss how she can help advance open government issues in Albania through collaboration with international NGOs. Mrs. Kryemadhi met with representatives of 7 international organizations in DC. Nada Zohdy of Open Gov Hub discussed recent Albanian government delegations they have hosted this year, and how they are offering more training on open government to government officials from Albania and other countries. She also encouraged the Chairwoman to support the development of a possible affiliate Open Gov Hub space and network in Tirana later this year or the next. Joe Powell of the Open Government Partnership discussed how Albania was one of the first countries to join this international partnership in 2011, and how she can help make sure that it continues to be a priority with the Albanian government today. He explained that these open government reforms can also be used as a tool in the important ongoing process to help Albania qualify for EU membership, as some of its neighbor countries have done. The Chairwoman discussed how her party has 4 main priority areas: economic development; education, security and universal healthcare. She explained that the majority of their supporters (80%) are young people who bring a new mentality of being decision makers and working for the good of their country (not their own personal benefit), so they represent the hope for Albania's new political class and future. She also said that the party is concerned about current efforts to privatize various sectors of the Albania economy, which are actually facilitating further corruption and very large fiscal costs through evasive Public-Private-Partnership (PPP) schemes. Mrs. Kryemadhi stressed that these companies which apply have strong corruptive ties to power, and there is no kind of transparency with citizens and Albanian taxpayers. She discussed her party's efforts to be transparent and open - including the fact SMI is the first party to have implemented new standards of financial transparency in the country, by fully publishing their financial information in real time. The group also discussed the need for a strong and independent Albanian civil society to oversee and hold the government accountable on key reform efforts including judicial reform. Finally, the group agreed that one of the most valuable ways international/outside organizations can support Albania's internal reform is by legitimizing the values of open government, showing that these are universal (not partisan) values for all people and should not just be associated with one political party or another - and sharing good practice examples from other countries.